When working out, lack of strength training is the biggest mistake often made by women. Even though the 1950's are fifty plus years ago, it still seems like there are still a lot of hang ups when it comes to women and weight training. 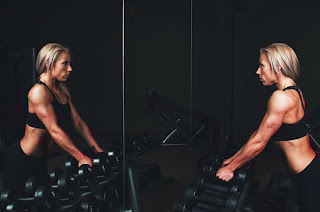 Women are able to do intense muscle building workouts just like men are - although, contrary to popular belief, working out is unlikely to cause a lot of muscle buildup unless you are taking a muscle building supplement. In fact, the sport of weight lifting will have the largest effect on your muscle tone, over any other workout activity. Use Larger Weights To Improve Your Muscle Tone. First of all, when it comes to strength training for women, you should throw away those tiny dumbbells that are sold in stores. These dumbbells might be marketed toward women, but the small 1-2 pound dumbbells will have very little effect on your actual muscle tone. This does not mean that you need to lift huge weights - but you should be able to feel the resistance in your arms when you pick up the dumbbells that you're going to work out with. In order to tone your muscles, you're also going to have to do a lot of regular exercise. Toned muscles are not all that difficult to get, as long as you are able to stick to a regular and consistent workout routine. A good routine to get into is to work on your arm muscles one day, legs the next, abdominal muscles on the third day, and then take a break on the fourth and then repeat. This will give you enough time to heal in between workouts, but it is regular enough that you should end up with well-toned muscles in no time. Studies have shown that people who are just beginning a workout program gain strength the fastest when they train each muscle group at least three times per week. It is also important to fit some cardio workouts into your week too. We recommend fitting three 30 minute workouts into your week. Cardio will help you to burn extra calories and also helps you with muscle recovery as it helps muscles to get rid of lactic acid build up that occurs from weight training. Muscles cannot properly rebuild themselves unless all lactic acid has been removed. To help her maintain her health, my wife has recently starting using a product called AdvoCare Glow.